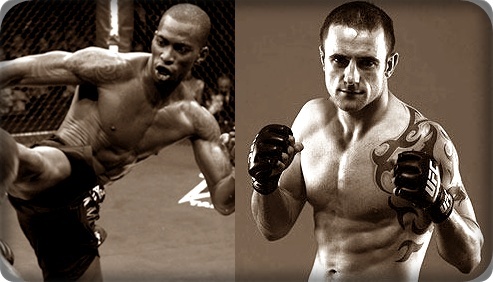 The UFC 138 taking place in the United Kingdom this weekend will feature a lightweight matchup between Anthony Njokuani and Paul Taylor. It’s a fight that has an excellent chance of being fight of the night with there being four fight of the night bonuses earned between both fighters. Let’s see how this one shakes out. Paul Taylor comes into this fight with an overall record of (11-6-1, 1NC) with 6 wins via TKO/KO and 2 submission wins to his credit. Taylor was last seen in action earlier this year knocking out Gabe Ruediger at UFC 126 in the second round. Taylor has had some notable fights in his UFC career, winning fight of the night honors 3 times. He has an incredible chin and has never been stopped via TKO/KO while most of his decision losses have been razor close. Taylor is a striker with a kickboxing background who loves to put on exciting fights. Anthony Njokuani comes into this fight with an overall record of (14-5, 1NC) with 8 wins via TKO/KO. Njokuani was last seen in action beating up former TUF finalist Andre Winner back at UFC 132 and winning a unanimous decision. Njokuani is a devastating striker with very good muay thai skills. His ground game is not up to par with his striking but he has improved his takedown defense quite a bit. Bet on Fighting has Njokuani was the betting favorite at (-270) and Taylor as the underdog at (+210). I agree with that line as I think Njokuani is the better striker and he may have a reach advantage on Taylor as well although they are roughly the same height. It’s simply going to be power vs. power in this one as both fighters will look to keep the fight on the feet. One thing that should be noted is that Taylor has never been stopped via TKO/KO in his career. However, Njokuani could be the most dangerous striker that Taylor has faced in his career. This fight will come down to who is technically superior and who can push the pace. I think the edge in both of those categories has to go to Njokuani. We saw him in a grueling battle with muay thai wrecking ball Edson Barboza and Njokuani probably should have won that fight. Njokuani does an excellent job of mixing his kicks and punches together, but mostly importantly he stays tight defensively and is very difficult to hit with solid strikes. Taylor is the total opposite, willing to take punishment to dish out his own which will probably backfire in this matchup. EDIT-Paul Taylor has been in a automobile accident and will not be fighting at this event.